My goals with any herp species I haven't yet seen in the wild are: (1) See it. (2) Get a photo. (3) Get a good photo. (4) Get a better photo. (etc.) This list celebrates the most egregious cases of reaching goal (2) but falling far short of goal (3). 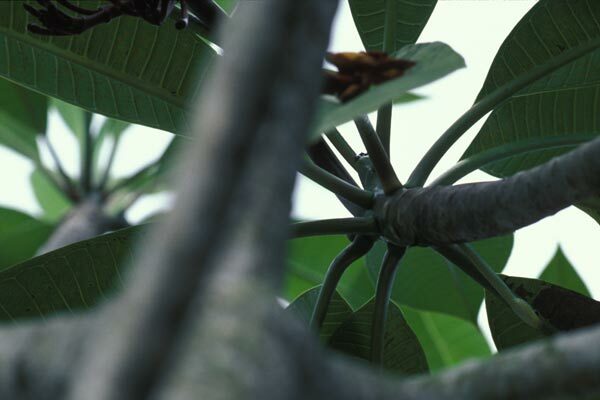 The Boomslang is a snake with a cool name and a notorious history. 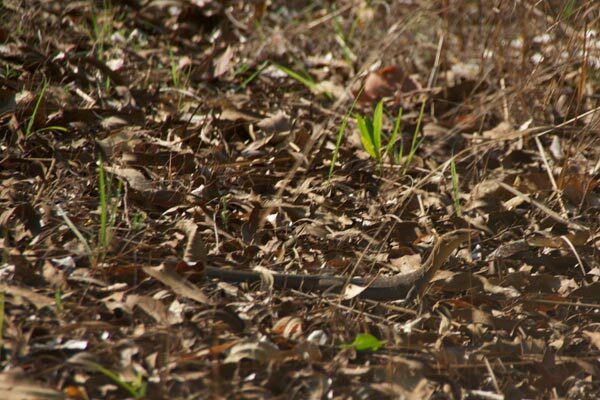 This was the only snake I saw on a wildlife tour that was more oriented towards big mammals and pretty birds, partly because our guide was afraid of snakes and didn't want to see them. I only saw it for about 10 seconds. It is a good thing that I didn't grab it to try to get a better photo. 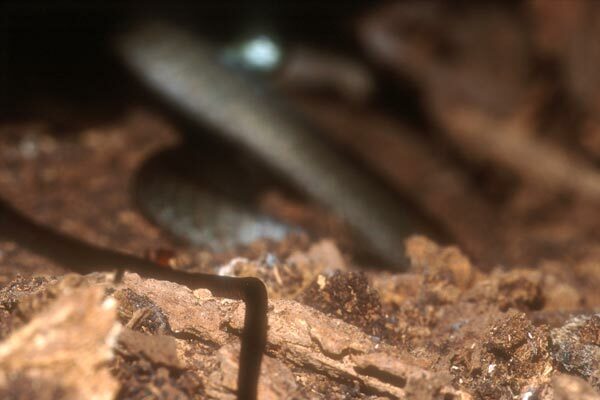 This is the kind of picture one gets when one attempts to photograph a long, thin, fast snake that is hiding in a hollow log in the dark of a rainforest drizzle, and one has no flashlight. And one (correctly) suspects that the snake is venomous. So far this list is 3-for-3 on fast-moving serpents. 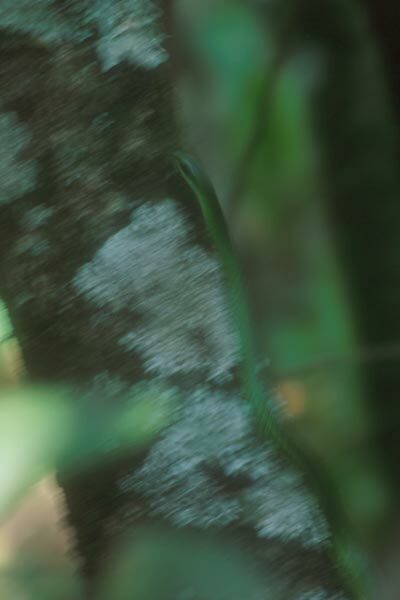 This green snake disappeared into the green foliage much more quickly than I could aim and compose. But hey, at least you can see this one's head, if you know exactly where to look. Hmm, treefrogs are not particularly fast-moving, nor scary to grab. So what is my excuse here? Well... I was feeling time pressure to look for Ridge-nosed Rattlesnakes before the day heated up too much, and I was just sure that I could find a bunch more of these frogs afterwards. But no more frogs were to be found that day. Remember back in the days of cheap point-and-shoot film cameras when "unintentional double exposure" was a thing? And not a good thing. Fortunately I have since been back to Madagascar with a real camera, though I did not see this particular species on my second visit. 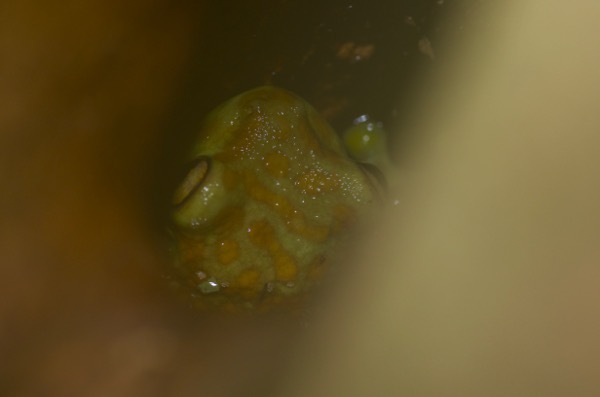 A local guide had followed the call of this frog to a water-filled tree-hole from which you could see about a third of a frog if you stood up tall and looked down at just the right angle with your flashlight. 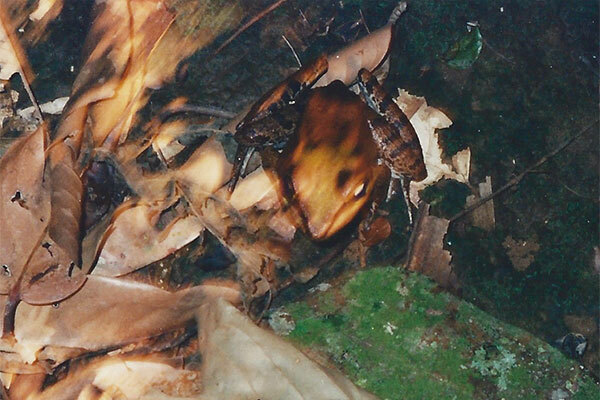 I didn't want to try to extract the frog from its lair so I had to settle for this terrible photo. Although I had been searching for this cool lizard for a couple of days, when I finally saw one I was still worried enough about the rain to eschew my fancy SLR for my wife's point-and-shoot. And not particularly wanting to ruin her point-and-shoot either, I just snapped a quick photo or two and then got the camera out of the rain. Camera shake due to low-light conditions? Poor auto-focus? Both? Next time I will trust my SLR's weather resistance (a feature which, to be fair, had not yet been developed when I visited Australia in 2003). In 1998 I had not yet learned the lesson from my 1996 Madagascar trip alluded to in #5 above. Another cheap point-and-shoot film camera, another litany of photo failures. Every time I look at this photo, I have to stare for a few seconds to find the lizard. 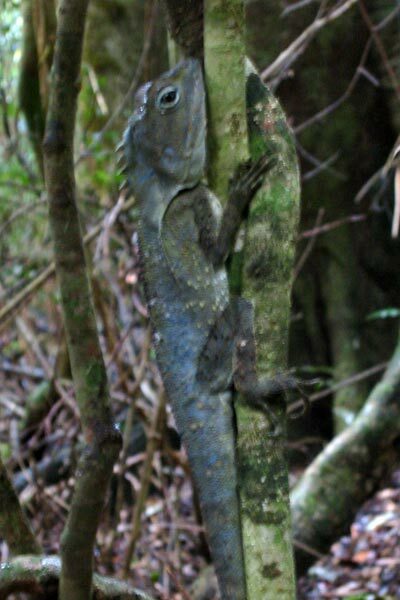 I could optimistically claim that this is due to the lizard's excellent camouflage in the leaf litter, but in reality it's just a terrible photo. This is reminiscent of #7 in that the day was drizzly and I was worried about my camera. 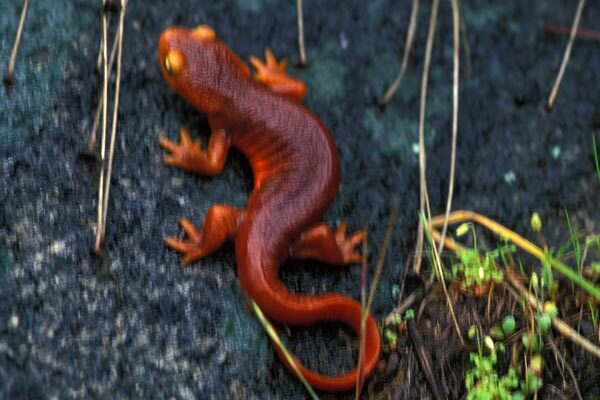 In this case I had no alternative, cheaper camera to sacrifice, but that darn newt just wouldn't stop moving. 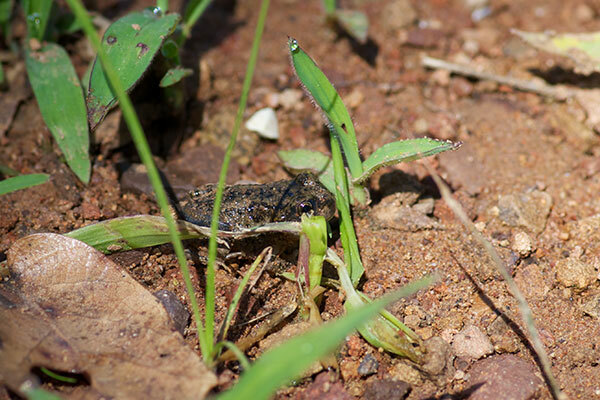 It really shouldn't be hard for me to find another one of these newts and get better photos, but I have failed so far.